How many times have you stopped at the door on the way into your house, taken a deep breath, closed your eyes and then quickly opened that door and ran past the first room that you enter? If you don’t make eye contact with it, then maybe that mess does not exist. We have all seen those cute mudroom and entryways in magazines…What?!?! No, those do not exist when you have kids. Or husbands. However, who says they need to be full of dirty soccer cleats, smelly jerseys from last Saturday’s game or backpacks that have not been cleaned out in 3 days?!? Sound like yours? Not me! Mine is never that way. Nope. I always put everything exactly where it should go, every single time… Okay okay. Who am I kidding??? I’m just like the rest of you! Sometimes life gets busy and mudrooms get buried under the chaos in the blink of an eye. 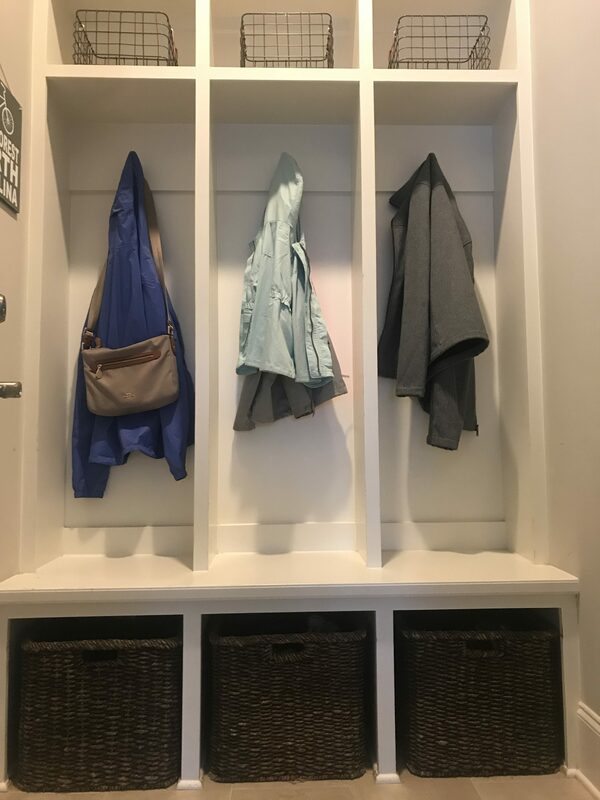 Here are some quick solutions to take your crazy, discombobulated mudroom to a clean, fresh, organized space in a matter of a few minutes. Step one: Find the hooks that exist in that space. Yep, they are there. I know you probably have cute hooks hiding underneath 5-6 different jackets, sweaters or even a few purses. Go ahead and hang those up in the coat closet where they belong. Because, let’s be honest, I am sure the ones that are hanging up on those hooks are from last season anyway! Am I right? Hang up the 1-2 coats that you use frequently…no more! Next: Bins! 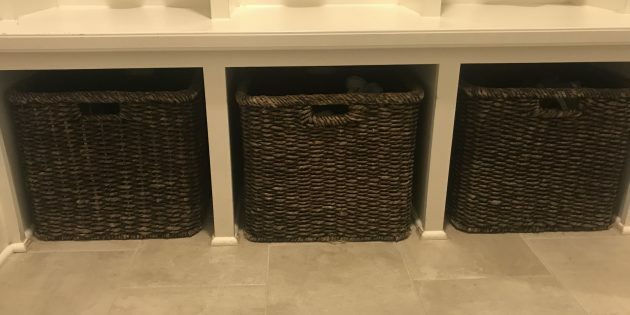 Yes, who doesn’t love cute, rustic bins to organize the shoes that are laying all over that space?! 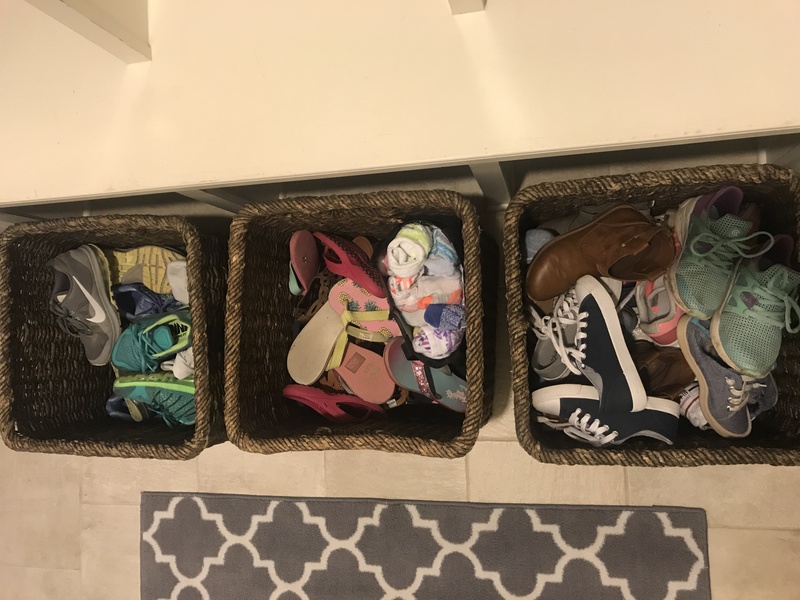 You can organize shoes by type and use the bins so each pair has a home, which is not the middle of the floor, even though our kids think differently. 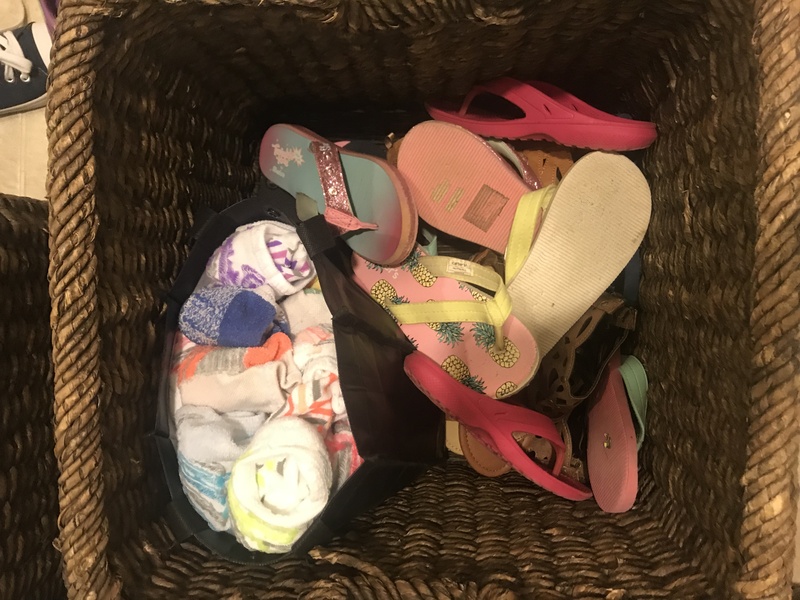 Put flip flops and sandals in one bin. Sneakers and shoes go in another bin. Lastly, boots and dress shoes in another bin. All others shoes, such as sports shoes need to go in the garage since they are smelly and dirty. Get them out of the mudroom. Kapeesh? COME ON KIDS…WE ARE LATE!!! How many times do you say that as you are trying to scurry out of the door for school, practice or dance?? Genius idea number 3: SOCKS. Leave a bin in your mudroom so that the kids can grab them and go. It will save you time and sanity. Promise! Lastly, find a new home for your kids’ backpacks, other than the mudroom. It only seems logical to leave them in there because that is the last place you walk through before leaving the house. Having those backpacks there to grab and go is a must! Well, that’s true, but maybe not alllll the time. 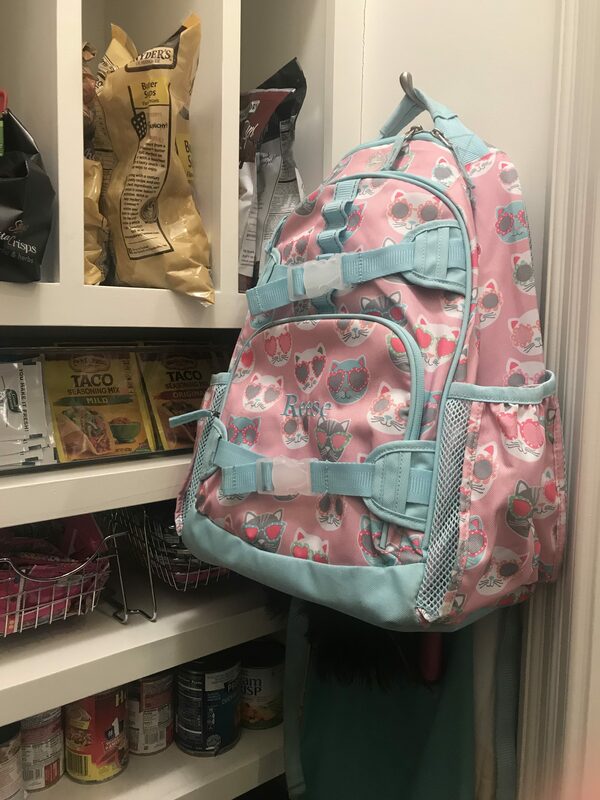 I have found that the kitchen is the best place for my daughter’s backpack because that is mostly where she dumps out all of her take-home paperwork, does her homework, and where I make her lunch. I suggest buying a hook and slapping it up in your pantry or a kitchen cupboard to get it out of the way until you get through practices and dinner. Then, once it’s packed up again, it can sit on the bench in your mudroom overnight so it’s ready to go the next morning. Easy peasy! 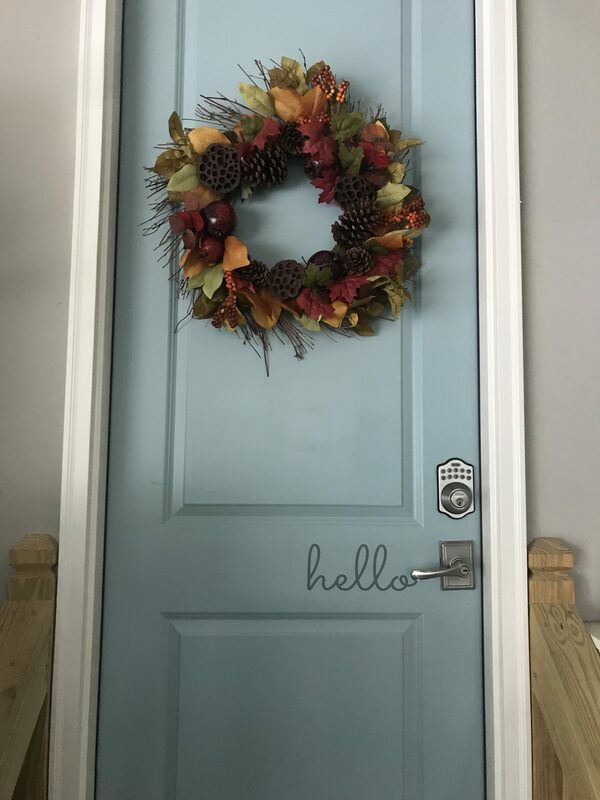 I truly believe that if you can follow through with these simple steps, your entryway will be a more pleasant place to enter your house each time.